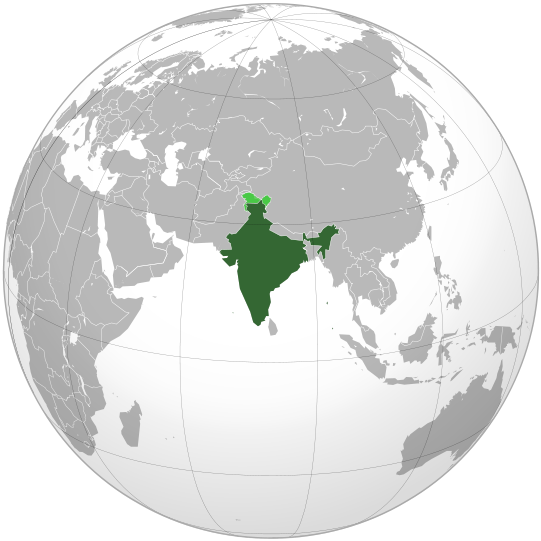 In 2009, as Indians debated institutional reform of their security forces in the wake of the previous year’s Mumbai attacks, HRDAG issued a groundbreaking report about the human cost of suspending the rule of law during a violent counterinsurgency campaign in the Indian state of Punjab. 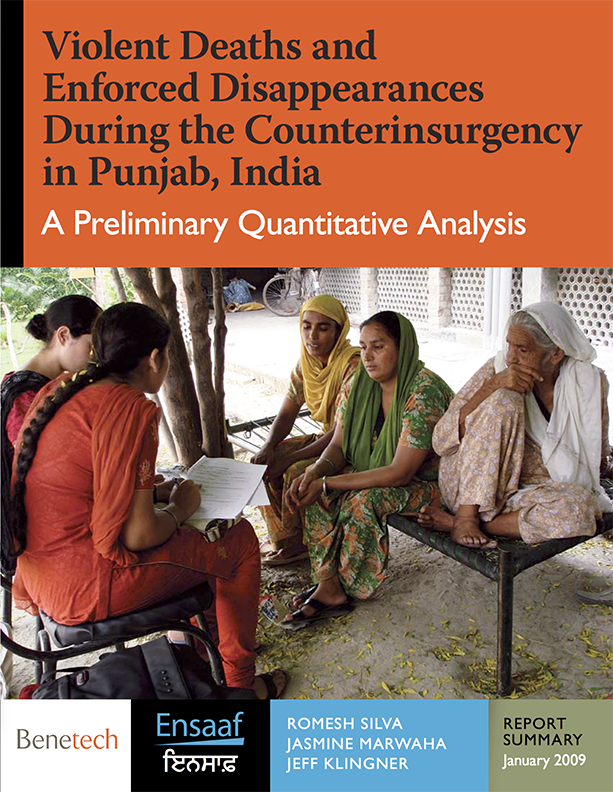 Together with our partner Ensaaf, HRDAG released findings that cast substantial doubt on the Indian government’s past explanations and justifications for disappearances and extrajudicial killings during the height of the Punjab counterinsurgency in the early 1990s. These findings contribute to an increasing body of knowledge that informs policy questions about the accountability of Indian security forces for past human rights violations. 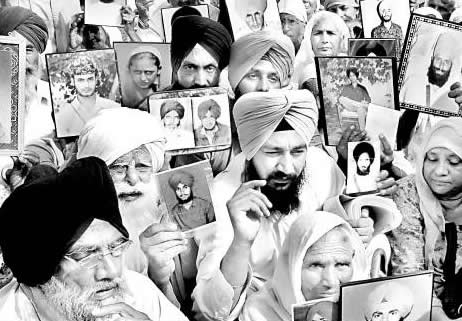 Indian security officials have dismissed claims of human rights violations as unavoidable “aberrations” during the counterinsurgency against alleged terrorists in Punjab from 1984 to 1995. This scientific analysis reveals that these statements given by the Indian government regarding the nature and extent of these violations are implausible given the available evidence. The report draws on more than 20,000 records from independent sources and analyzes them using accepted statistical methods. HRDAG demographer Romesh Silva and HRDAG computer scientist Jeff Klingner are co-authors of the report together with Jasmine Marwaha, Program Associate at Ensaaf. 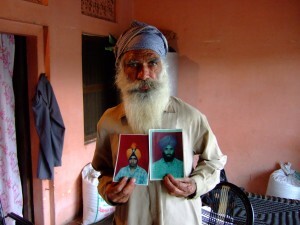 A man shows photos of his sons who were disappeared during the Indian government’s counterinsurgency campaign in Punjab. Human rights organizations have collected extensive qualitative evidence about the types of abuses committed by Indian security forces and the impunity that persists in Punjab. Until now, human rights groups have lacked the capacity to conduct quantitative research to analyze these violations and definitively challenge explanations put forward by the Indian government. 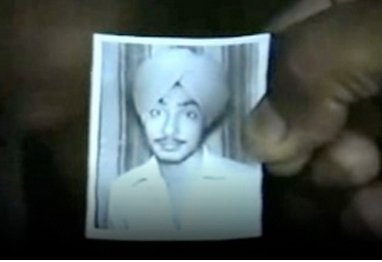 The available data sources, each collected through substantially different social, political, and legal processes, are generally consistent in noting that enforced disappearances and extrajudicial executions in Punjab were overwhelmingly concentrated in the early 1990s when the government intensified its counterinsurgency operations against alleged Sikh militants. The strong correlation between reported lethal human rights violations and overall reported lethal violence across time is inconsistent with official claims that human rights violations were “random” or “minor” aberrations. The analysis also demonstrates that between 1988 and 1995, militant deaths reported from an “encounter” or exchange of gunfire with the security officers were strongly correlated with lethal human rights abuses reported by the victims’ families. This correlation supports previous qualitative analyses by human rights groups that these encounters were fabricated by security forces to conceal extrajudicial executions. Witnesses describe the extrajudicial killing of Kulwant Singh. The report further demonstrates that when human rights violations increased dramatically after 1991 and fewer families were able to recover the bodies of their loved ones, “illegal cremations” acknowledged by the Indian National Human Rights Commission also increased. 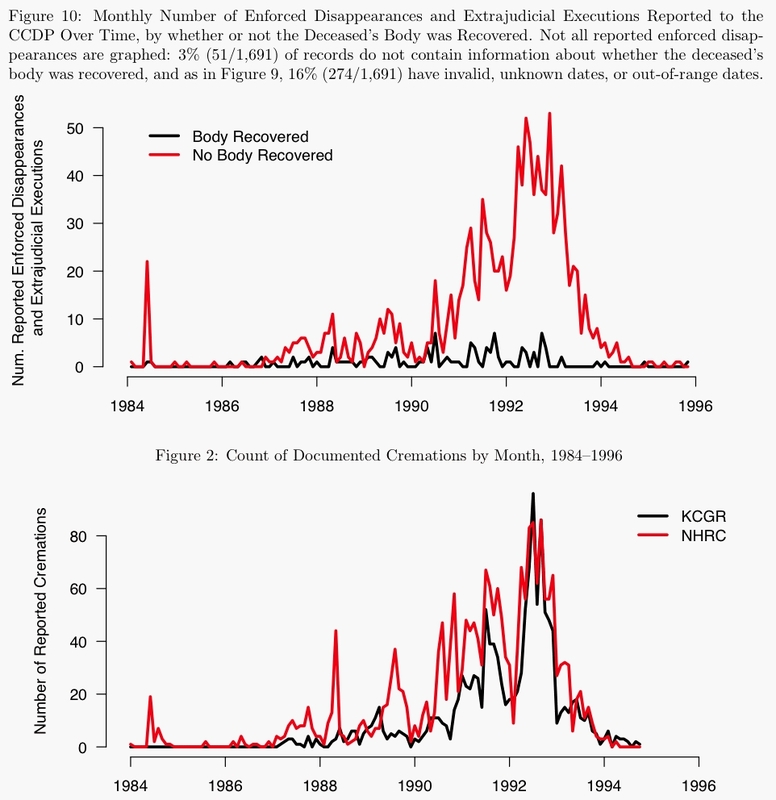 The strong correlation between these events suggests a shift in state violence during the height of the counterinsurgency towards large-scale enforced disappearances and extrajudicial executions, coupled with mass cremations to dispose of the bodies. The HRDAG/Ensaaf report is the most comprehensive, quantitative analysis to date of available data on human rights violations during the Punjab counterinsurgency. 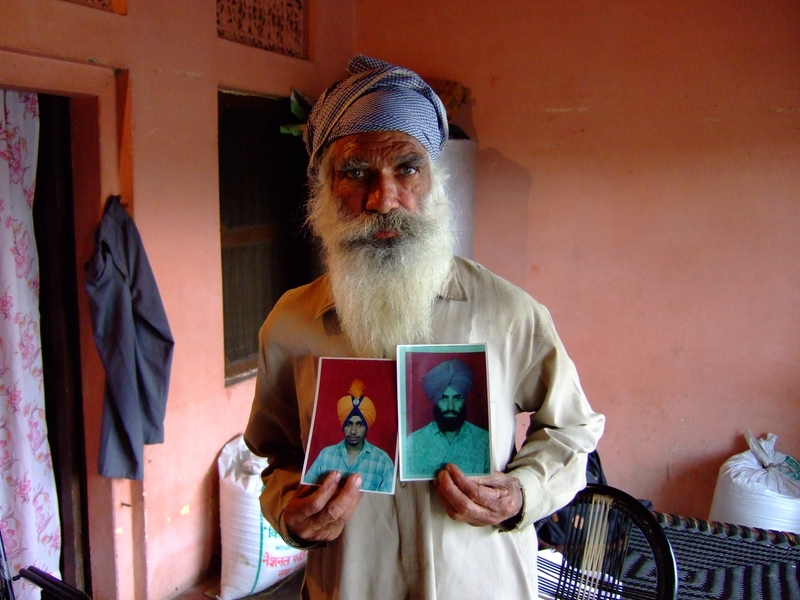 The analysis reviewed data from the local English-language newspaper, the Tribune, cremation ground records collected by the late human rights activist Jaswant Singh Khalra, acknowledged cremations by the Indian National Human Rights Commission, and reported lethal human rights violations gathered by the Committee for the Coordination on Disappearances in Punjab and the People’s Commission on Human Rights Violations in Punjab. The observed patterns of reported human rights violations, reported deaths of alleged militants, and reported secret “illegal cremations” shed further doubt on the government’s official accounts of lethal violence in Punjab and its justification for such a disproportionate use of force. Top graph shows the monthly number of enforced disappearances and extrajudicial executions reported to the Committee for the Coordination on Disappearances in Punjab (CCDP) over time, by whether or not the deceased’s body was recovered. Bottom graph shows a count of cremations by month documented by the National Human Rights Commission (NHRC) and Khalra Cremation Ground Records (KCGR) 1984–1996. Additional data and analysis will allow for clarification of the total magnitude and patterns of violence throughout Punjab, broadening the discussion about the impact of counterinsurgency strategies on human rights. Scientifically defensible analysis of political violence can help enable honest public dialogue and support an historically accurate narrative of the counterinsurgency in Punjab, and initiatives for justice. This effort was part of joint work by HRDAG and Ensaaf to introduce new evidence available to truth, justice, and accountability processes that are focused on political violence during the Punjab counterinsurgency. In particular, it is hoped that this work will increase the quality and quantity of evidence available to the National Human Rights Commission and Supreme Court of India, as they continue their investigations into mass violence associated with the Punjab counterinsurgency. HRDAG and Ensaaf hope that this work will also help engage the security forces in a debate about past human rights violations which is informed by empirical data, guided by established scientific methods and framed around international human rights norms. HRDAG, in partnership with Ensaaf, is collecting additional data on past human rights violations during the Punjab counterinsurgency. We are extending our current work by employing inferential statistical methods to answer key questions about the total magnitude of all enforced disappearances, the extrajudicial killings in Punjab and which institutions should be held accountable for these acts. The citizens of Punjab seek the truth about the killings and enforced disappearances that took place during the counterinsurgency campaign.